Packed with flavour, beef can be enjoyed in many different dishes, as the recipes in this feature prove. But even if your beef is perfectly cooked, it is the quality of the meat that makes the finished dish a real success. Andy works closely with specialist meat suppliers Dovecote Park of Yorkshire to ensure all these elements are in place. Cattle sired by an Aberdeen Angus Pedigree Bull are allowed to graze outside as much as possible so that they are properly mature and at the optimum weight. The result is juicy and richly flavoured beef. The meat intended for roasting, grilling, griddling or frying is then hung on the bone for seven days in order for it to mature and to develop both texture and taste. The meat has a close-grained texture, with threads of creamy fat known as 'marbling', which give it its famous succulent, 'buttery' character. Aberdeen Angus is available on the meat service counter and in a small prepacked selection. We also use it in some of our ready meals - look out for the Waitrose Aberdeen Angus Beef logo. Try this superb meat in all your favourite dishes. Its superior quality makes all the difference. The high heat used in these cooking methods quickly seals in the flavour of the beef and is perfect for tender cuts such as steaks. These cuts can be cooked with very little fat or oil. Brush steaks with a little oil to prevent them from sticking and place in a smoking hot griddle pan or frying pan, or under the grill until the meat is cooked to your liking (see the 'thumb test' below for a guide). Fillet steak is the least fatty cut and the most tender. Choose rump or sirloin for a more intense taste and slightly firmer texture. In summer, buy rib eye steaks - these are taken from the ribs that we sell as roasting joints during winter and have the same excellent flavour. For many of us, roast beef with all the trimmings is the epitome of that great British institution, Sunday lunch. Roast the meat in a medium oven to reduce shrinkage and seal in the flavours. Small joints tend to shrink more than large ones, so choose a good-sized piece of meat - any leftovers can be used in sandwiches or enjoyed with a salad. For the best results, choose sirloin, topside, top rump or a rib of beef on the bone, which is considered by many people to be the finest for roasting. Leaving the bone in helps the joint to retain moisture and flavour during cooking. Sirloin is also available as a rolled joint and is one of the tenderest of cuts from the back or loin. Braising - sealing the meat then cooking it in liquid - is the best way to cook the leaner (and cheaper) cuts of beef. Sealing the meat locks in its flavour and juices. For casseroles choose braising steak, which is available ready diced from the meat service counter or prepacked. Brown the beef in batches of 5-6 pieces on a high heat for 1-2 minutes on each side before adding liquid. Slow-cooked meat casseroles develop a rich, intense flavour and most improve their flavour if cooked the day before. You could make double the amount needed and freeze half. 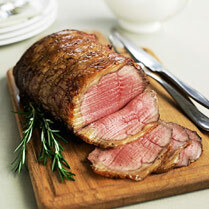 Sear whole joints such as silverside or brisket in a pan, then pot roast them for a meltingly tasty result. Use the 'thumb test' to decide whether steak is cooked to your liking: it should feel as firm as the flesh on the ball of your hand. Rare: with a relaxed hand, place the tips of your thumb and second finger together. The muscle at the ball of your hand will feel soft and spongy. Medium: with a relaxed hand, place the tips of your thumb and third finger together. The muscle at the ball of your hand will offer more resistance. Well-done: with a relaxed hand, place the tips of your thumb and little finger together. The muscle at the ball of your hand will feel resistant and very firm.